Welcome to the weekly edition of Real Food Weekly. This is where you get to share your recipes using Real Food. I’m wondering if anyone has any recipes using snow. We just got dumped on and I don’t think I’m going anywhere for some time so I’ll have plenty of time to check out your recipes. I tried a new recipe this week for Braised Stuffed Calamari. Here is the Taste Test Results. 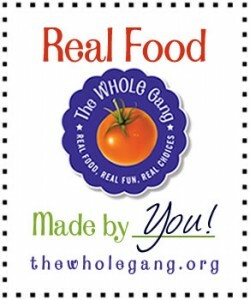 Please share your recipes using Real Food. No preservatives, as little processing as possible, fresh, in season and local is the best possible choices. Oh and organic foods rock. I've posted my black bean sweet potato tacos this week. We are CRAZY for them at our house. The grated sweet potatoes and the spices make for some sweet spicy comfort food that is so good for you. Can't wait to see the other submissions! I've posted our favorite recipe for Superbowl Sunday – Pulled Turkey Barbecue. Hope you and your family are keeping warm! Thank you for sharing Megan! Diane- how the heck did I not know about this event? I would have been all over it since it started! Thank you Brittany. Jump in any week. It happens every Thursday. I would love for you to share your recipe link.